Forty years ago, when I came from my home in Taiwan to the U.S. in order to study for my MFA, I couldn't imagine that my life would take such a dramatic turn. In a very short time, I went from being a sheltered girl to becoming an independent young woman. Without realizing it I has also stepped into a life-long journey to find God. On this journey, I have come to learn that "God is Love" and He is always with me. His love will sustain me in good times or bad times and even in the darkest moments of my life. This knowledge has allowed me to put my trust in Him and with a thankful heart, move forward without fear, worries, and self-doubt. I am now a senior citizen, and also a new Catholic with the loved passed on from my parents to me. 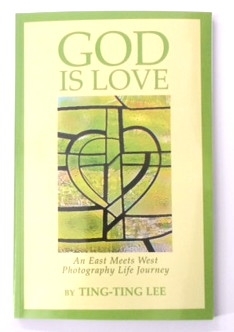 The blessings I received from the Holy Spirit, and photographs I have taken over the years, I have an "East Meets West" life story to tell through my book God is Love.